Put the book DOWN!. . 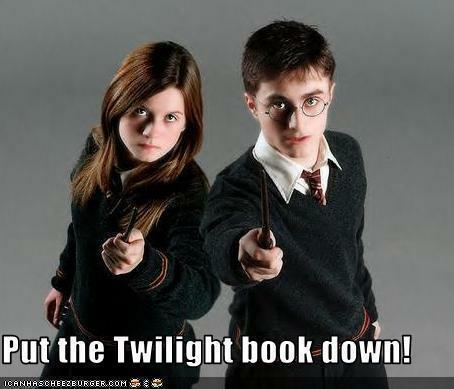 Wallpaper and background images in the 해리 포터 대 트와일라잇 club tagged: harry potter series twilight book down harry ginny weasley. This 해리 포터 대 트와일라잇 photo contains 겉옷, overclothes, 겉 옷, overgarment, 겉옷, 외투, 겉 옷, 잘 입고 사람, 정장, 바지 정장, 잘 차려 입은 사람, 양복, and pantsuit. There might also be 상자 코트, 박스 코트, 상자 외 투, 후드, 레저웨어, and 여가 복.
hey!lower ur wand!i'm on ur side!